Marooned In Marin: Is There An Upset In The Making Next Week For "Jihad" Gerry Connolly? Is There An Upset In The Making Next Week For "Jihad" Gerry Connolly? I've been following the campaigning in the Congressional District I live in, VA 11, where I'm unfortunately represented by Congressman "Jihad" Gerry Connolly, who is bought and paid for by the Muslim Brotherhood. But there's a good chance there may be an upset in the making next week for Connolly. Consider this from a month ago in The Weekly Standard. Democratic congressman Gerry Connolly of Virginia may be vulnerable for reelection, according to details from an internal poll conducted on behalf of his Republican challenger. Connolly, the three-term Democrat who respresents a chunk of Washington's Northern Virginia suburbs, is reportedly below 50 percent support in the poll, which was leaked to a conservative Virginia politics blog called Bearing Drift and was confirmed by the campaign of Republican candidate Suzanne Scholte. According to the campaign, Connolly polls at 48 percent against Scholte, and just 26 percent say they are definitely voting for the Democrat. Connolly's approval rating is 45 percent, and in a head-to-head match-up with Scholte among those who know both candidates, he leads her by just one point, 45 percent to 44 percent. The Scholte campaign would not provide the Republican's performance against Connolly among all those polled. Scholte's cash-strapped campaign is banking on two issues to help her make the race competitive. One is her cachet with the district's sizable Asian community. A human rights activist, Scholte has worked with political refugees from communist nations, particularly those from North Korea. That gives her a foothold within a group not normally predisposed to Republicans. If her candidacy can increase turnout among the Asian-Americans in Northern Virginia, it might make Scholte competitive. The second issue is Connolly's vote for the Budget Control Act in 2011. While presidential politics overwhelmed the conversation in the 2012 election, the indiscriminate cuts to the federal budget as a result of the law remain a potent issue in Northern Virginia. The BCA mandated Congress make certain budget cuts or see across-the-board reductions in spending as a result. The law was designed to spook members of Congress into making those cuts, but the gambit didn't work, and after some delays, sequestration of defense spending and other government spending have taken place. Scholte also seized upon Connolly stating he would oppose any attempt to stop funding the Hamas-led Palestinian government that launches terror attacks against Israel, as well as his defense of the Muslim Brotherhood. 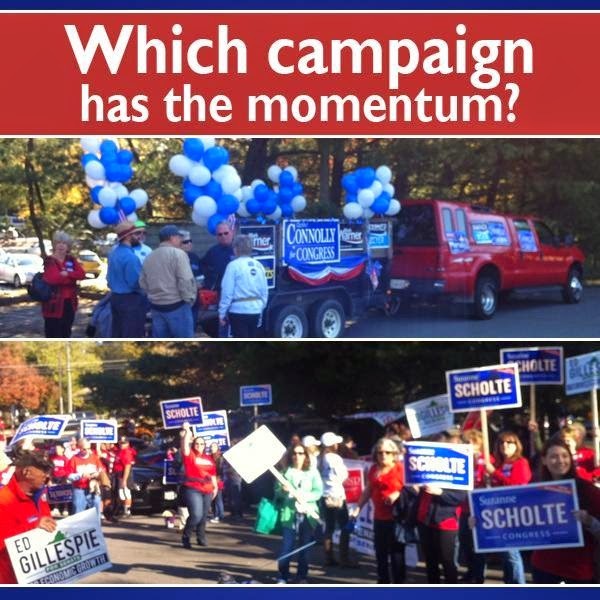 Scholte has also shown voter enthusiasm at local community events where supporters of both candidates have appeared. Scholte has also campaigned using her background as a human rights leader and consensus builder. This as Connolly has shown himself to be a partisan shill who constantly toes the party line as needed by Pelosi and the Democrat leadership. It will be interesting to see what happens next week. I'd certainly love to see Scholte pull and upset and retire "Jihad" Gerry. VA 11 could use some real leadership to tackle not just our national problems, but what's in the best interest for the area as well.